Guess Who Saw His Shadow? (Newser) – The handlers for groundhog Punxsutawney Phil say he's forecasting six more weeks of what already has felt like a brutally long and cold winter. 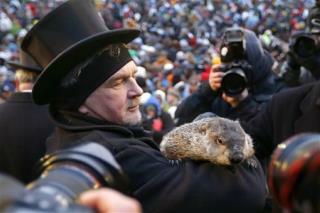 Pennsylvania's famed groundhog emerged from his lair in front of thousands of fans around daybreak today. Legend has it that if the furry rodent sees his shadow on Feb. 2, winter will last another month-and-a-half. If he doesn't see it, spring will come early. The fact is, Punxsutawney Phil is a good predictor. This is a binary decision system, two manifestations being connected, uniquely, with two outcomes, Phil seeing his shadow or not, early warm weather or six more weeks of cold, wintry weather. “Scientists” try to depict Phil as being wrong 39% of the time and of this being “no better than guessing”. In fact, in a binary system, 50/50 is the worst performance. It indicates a purely random situation. If the system produces 39% erroneous results that indicates a force pushing the system in one direction! And that indicates the ability to predict! In fact, Punxsutawney Phil is not “wrong”, he only goes back into his warren or remains out! It is the “interpretations” that have been erroneous! Switch the interpretations around, saying if he sees his shadow it indicates warm weather coming, if he stays outside it means winter will continue, and he will be right 61% of the time! In fact, bright, sunny weather can indicate the coming of warm temperatures, cloudy weather can indicate cold weather will continue. To the extent there are claims the skies where Punxsutawney Phil lives were cloudy today, and lights around him caused him to see his shadow, this can indicate cold, wintry weather will continue. Assuming, of course, that the government program of doping the skies with weather control chemicals from high flying jets, leaving long non dissipating vapor lanes in the sky that can stretch from horizon to horizon and last up to an hour, what have come to be called “chemtrails”, doesn't change that. But, in fact, “scientists” could have explained this aspect of Punxsutawney Phil's behavior long ago. But “scientists” are devoted to trying to convince the public that they can't trust themselves to decide for themselves what is right. They want the public to be dependent on them!